This Game has no Background Story. 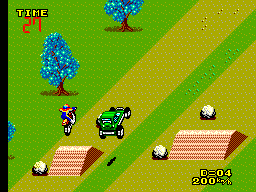 Basically you take control of a biker and you have to race to the end of a series of courses littered with ramps and obstacles. You race against the Clock. And there are some Buggys or Bikes on the Track you must pass, for everyone of them you get one Point. After each Track you can spend your Points to upgrade your Bike. For example you can buy a better Engine or new Tires, improving the Tires makes it easier to drive over Sand or Water and a better acceleration makes you faster so you can pass more Buggys/Bikes and get more Points. The Gameplay is OK. The other Drivers have a nice A.I. as they made mistakes and drive against Trees or Stones. There are 5 Tracks and after that you must drive them again, this Time with less Time to finish the Track and its all a bit more difficult. Two things I don't like are the missing two Player Mode and there are no Level passwords or Saves, so your Time or your Bike won't be saved. The Graphics are plain. You play from a diagonally view. The Colors are a bit odd. In the first Level you pass some blue Trees and the final Level shows you blue Mountains. I really wanna know, what Drugs the Graphic designer takes... The Bikes and Buggys are nice drawn, but nothing too spectacular. But looking on the Age of the Game I would say its nice. Nothing special about the Sound. The Music is OK and the sound effects are nice, but the sound of the Engine is a bit low and it sounds more like an Lawnmower than a Bike. The Controls are like in every Racing Game. Button 1 is for acceleration and Button 2 for the Brake (which is absolutely Pointless). Press the D-Pad Down is to make a Wheelie to come easier over Ramps. Enduro Racer is a nice little Game to play if you're bored. 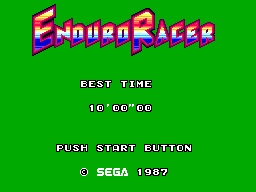 I think with a Battery to save the Racing time and the Game, this game would have a much higher Replay Value as you can fight with Friends for the best Racing Time. With a 2 Player Mode and a Battery this Game would be really great. If you like Racing Games you should take a look at it. 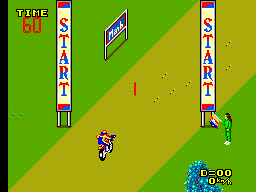 As there are not really much Bike Games available for the Master System, I would say its the best one after GP Rider.